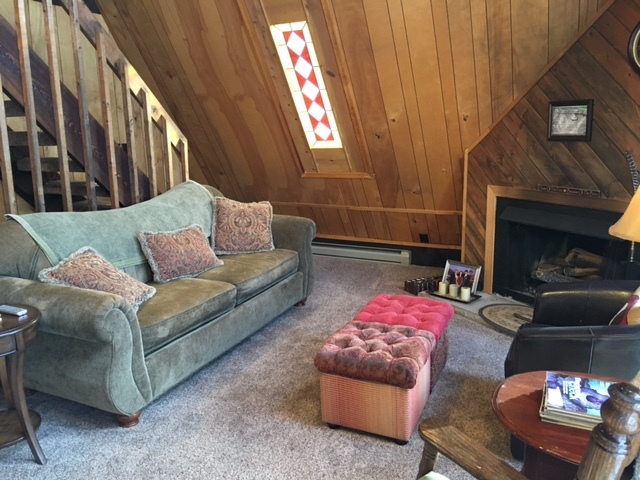 This cozy country cabin is located near Lake Wallenpaupack in the Tanglewood Lakes Community! 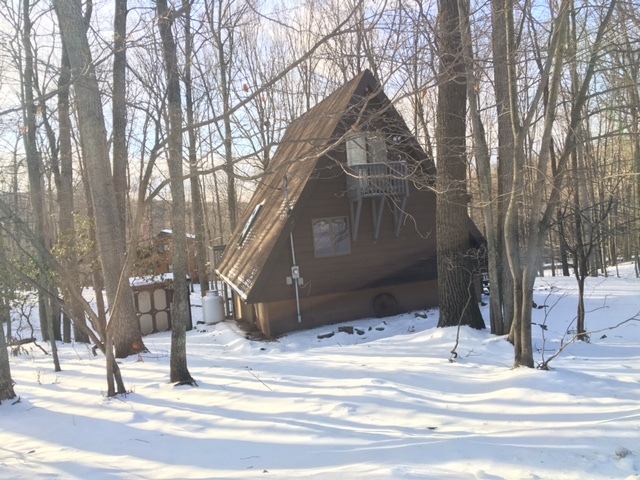 Nestled in a beautiful wooded secluded area is this 3 bedroom Resort Cabin which is located in Tanglwood Lakes community in the Lake Region of the Poconos Mountains with serenity, privacy, and access to large Lake Wallenpaupack. 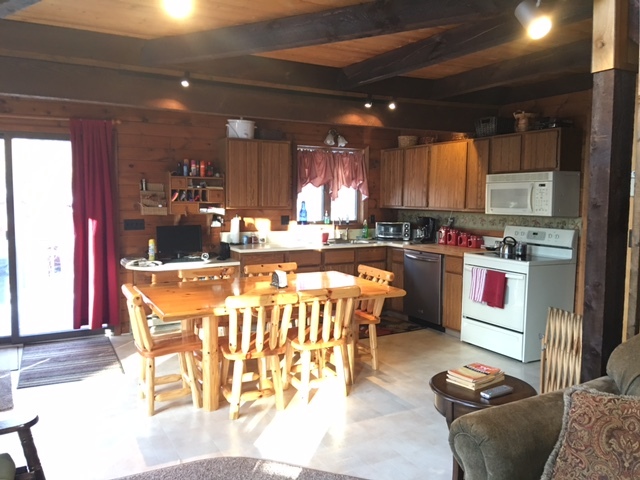 This Poconos cabin features an airy open living room/dining/ kitchen area. The fully equipped country kitchen includes everything you need to dine in, as well as a separate dining area with views out to the woods. There is also an outdoor barbecue grill on the very large rear porch. 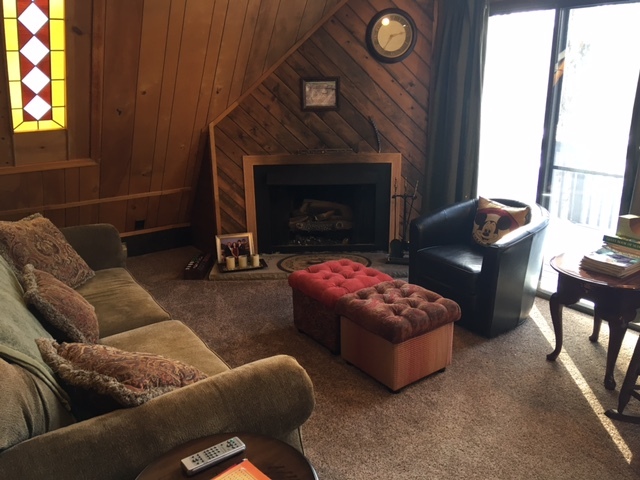 Enjoy the Poconos foliage view or just the perfect spot to sit back and relax or read a book in a cozy chair! 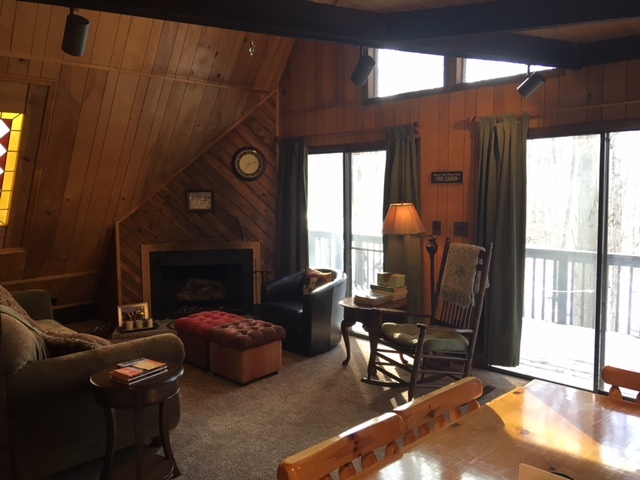 This Poconos cabin is within walking distance to the lake and beach and makes it perfect for your next family vacation or couples’ getaway in the mountains. 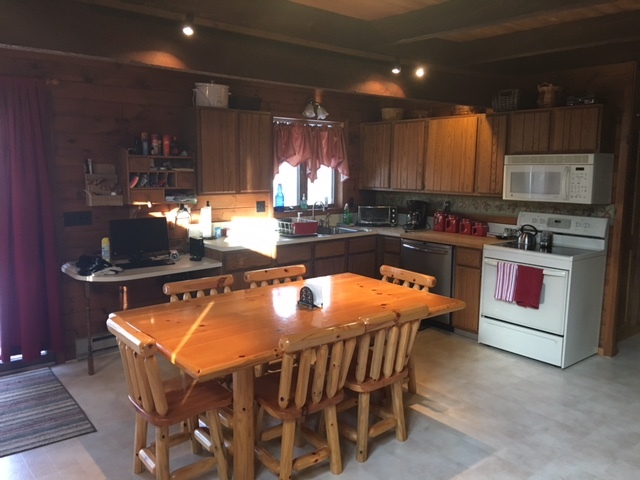 This beautiful Poconos cabin features a full country kitchen and is equipped with everything you need to cook a spectacular meal. Or, after a full day of enjoying all the Poconos have to offer, relax, grill up dinner from one of the many local farm merchants on the barbecue. This home features three levels of living. 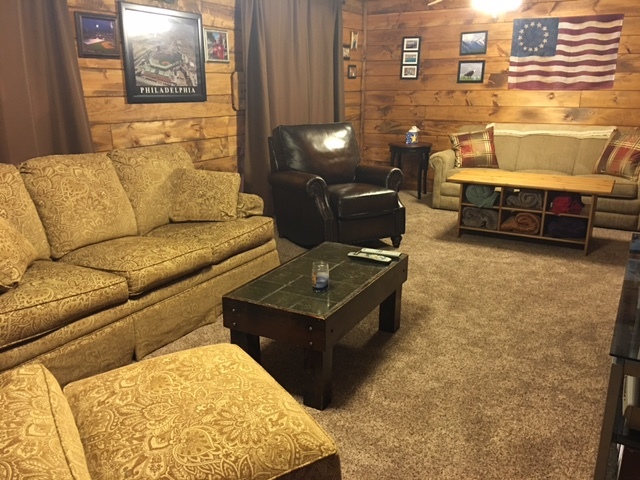 This country cabin has a great open layout. Walking into the home you will see the large kitchen to the left, which then opens up to the dining area and living room. 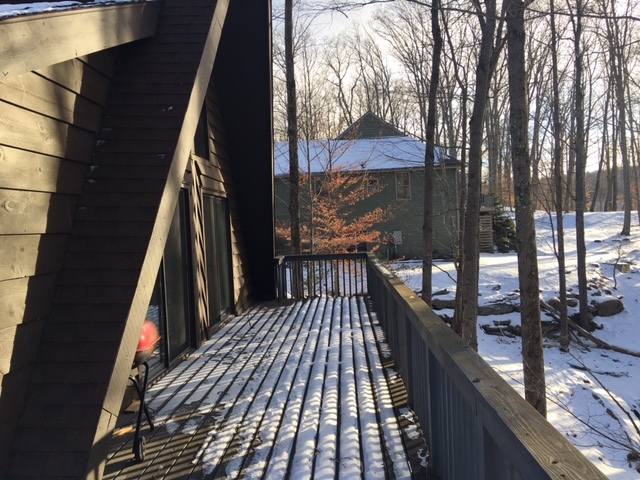 The two large sliding doors brings the outdoors inside with beautiful views of trees and Pocono skies. 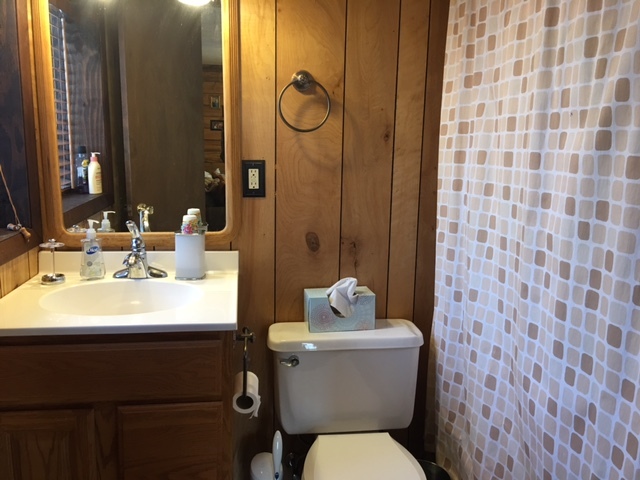 The main level has one bedroom with a queen and full bathroom for your convenience. 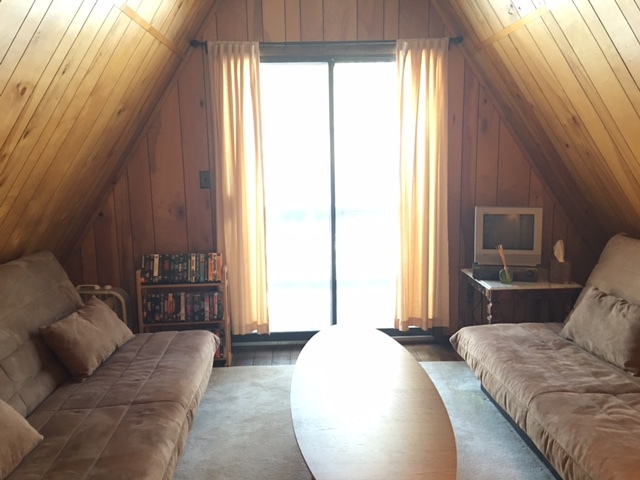 Walk upstairs to find the second bedroom featuring two futons and small loft area with games and table. 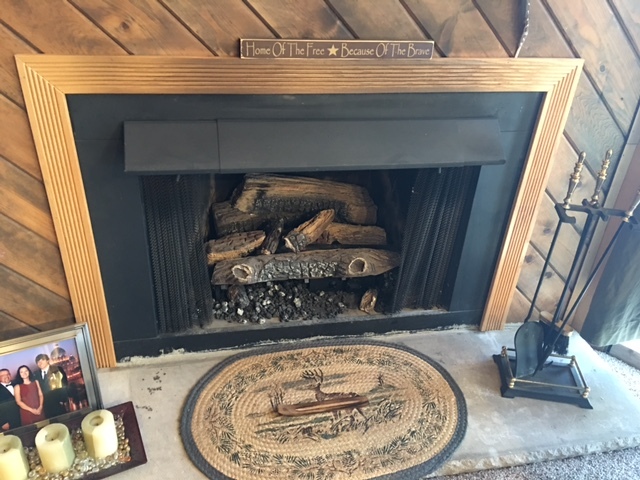 The lower level of the home has been remodeled with wonderful wooden planked walls and new carpet. 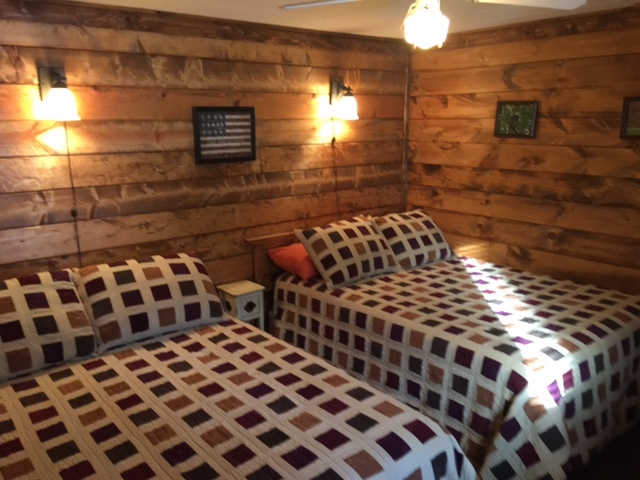 The third bedroom is located on this level with two queen beds inside. 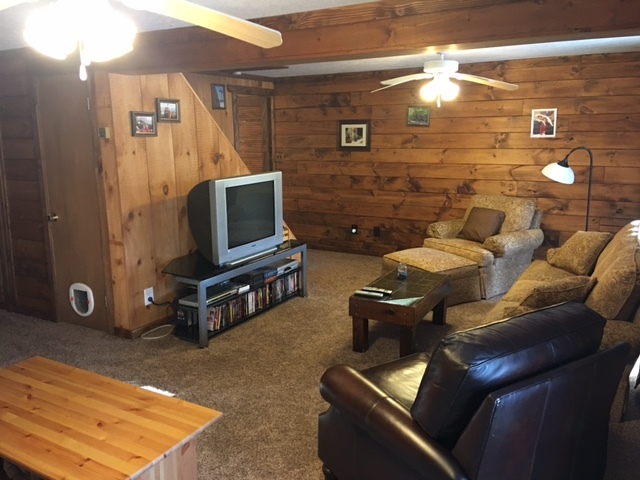 The second living room boasts a large TV and two couches with plenty of seating. One couch is a sleeper for your extra guests. 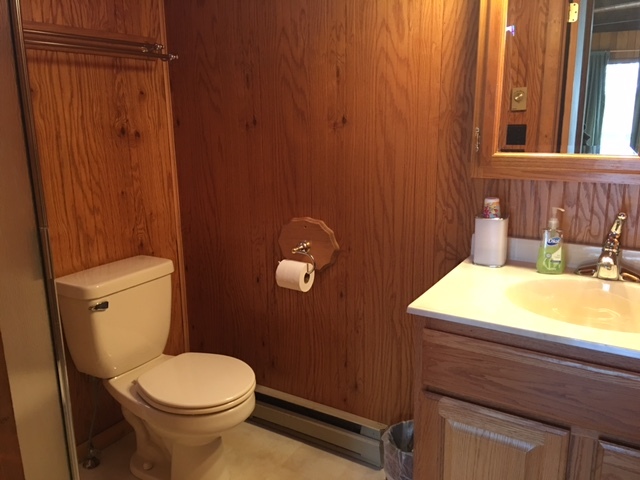 The laundry and second bathroom is located on this bottom floor. Beach – The beautiful beach on Lake Wallenpaupack is one of only 2 permitted beaches on the big lake. The beach is open to residents & renters from Memorial Day to Labor Day with Lifeguards on duty from 10am to 6pm every day. The TLCA area includes a beautiful covered gazebo with seating and cooking facilities, a bathhouse with rest rooms, an open deck picnic platform and additional picnic tables and charcoal grills on the grounds. There is also a volleyball court and paved parking areas. Marina – TLCA has a marina with 105 permitted boat slips which are rented annually. There is also a boat ramp for residents who choose to launch boats periodically for a yearly or daily fee. Playground/Ball field – Tanglwood has a large playground for children in the midst of the community. At that location there is also a basketball court, a ball field and a handball court for residents to enjoy outdoor sporting activities. The basketball court is converted to an ice skating rink in the winter. Briarwood Trail – Across from the playground we have a scenic 1 mile hiking trail around a beautiful stream to enjoy a peaceful walk in the woods. A variety of trees, animals and birds can be enjoyed in the lovely area. Lake Tanglwood – This beautiful pristine lake is a perfect setting for canoeing, kayaking and fishing, with docks and boat racks at 2 locations on the lake. The docks provide a perfect location for fishing with children/grandchildren. Community Center /Fitness Room – In close proximity to the 18th hole of the Paupack Hills Country Club, is the TLCA the community center. The center is used for meetings, small parties, card games, and movie nights. There is also a small library and Wi-Fi is available. The building also will soon house a new fitness center with top grade commercial aerobic equipment and a universal weight system. Outdoors at the center there is a picnic area with bocce ball court and horseshoe pit for residents to enjoy. Tennis Courts – The community operates and maintains a newly renovated 2-court tennis area on the Paupack Hills Country club property. Equipment for “Senior-Friendly” pickleball is also available at the golf club pro-shop. Paupack Hills Country Club – Nestled inside our community is the beautiful privately- owned PPH championship golf club. The Club offers TLCA property owners reduced playing fees and includes a convenient full-service restaurant. Maintenance Dept. – TLCA has a small maintenance staff that provides weekly garbage pick-up, facility maintenance, grounds and road maintenance including winter snow plowing. Public Safety – The Safety staff is on duty from 7am to 11pm (1am on weekends) daily to enforce the Communities rules and regulations. These duties include speed enforcement to protect the safety of our pedestrians and golf cart drivers, enforcement of property maintenance guidelines and they conduct regular patrols of all locations to keep our residents safe and provide assistance as required. 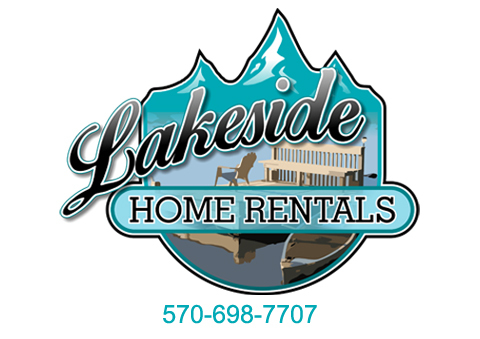 The rental cabin is within walking distance from Lake Wallenpaupack, where you can rent jet-skis, powerboats, and other types of watercraft. Also just minutes from a zoo, driving range, farmers markets, horseback riding, antique shops, and nature areas the Poconos are known for, including state game lands. 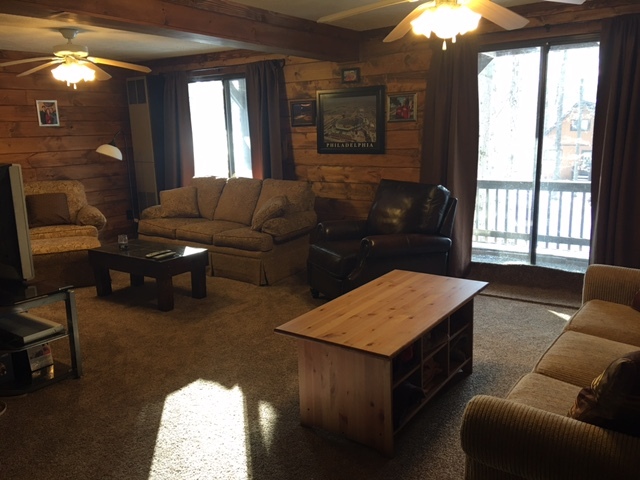 Each cabin is only one-half hour from several major ski areas, including Montage Mountain, Elk Mountain, Shawnee and Mastope/Big Bear, where you can go skiing, snowboarding, and snow tubing. Also enjoy the museums, cultural centers, theaters and cinemas. Indulge in the spa, or try out several Poconos golf courses, water parks, malls, white-water rafting, outlet shopping, and historic sight-seeing tours. And it’s only ten minutes to the best ribs anywhere – guaranteed. We offer discount coupons to these and many other special local activities and events, as well as provide event guides for local Poconos happenings. 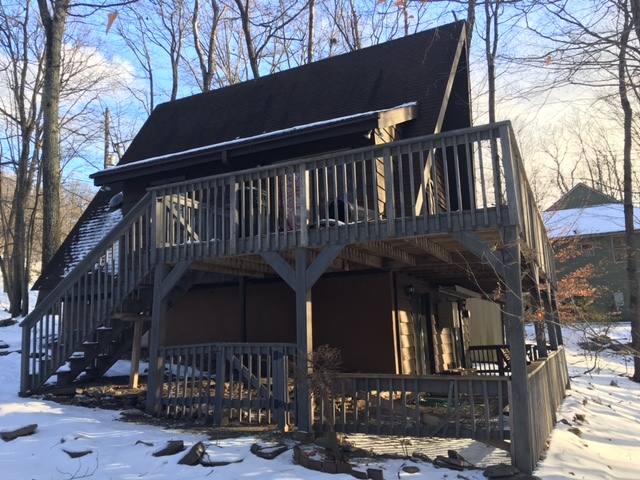 If you’re looking for a serene and rustic Poconos cabin, this rental property is just for you. 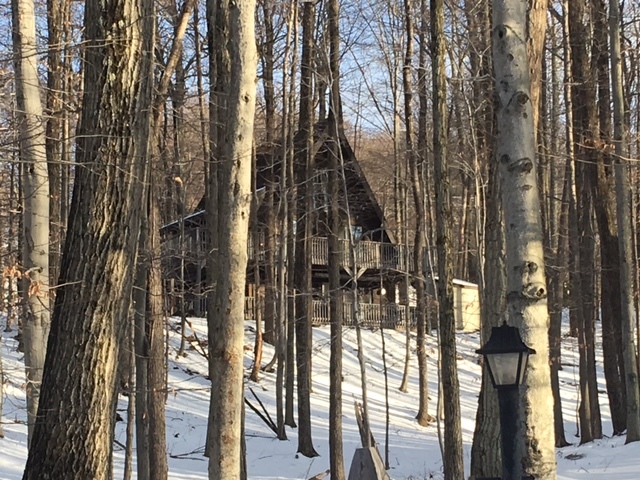 Surrounded by trees, this Poconos cabin can’t be beat as the ideal mountain getaway. 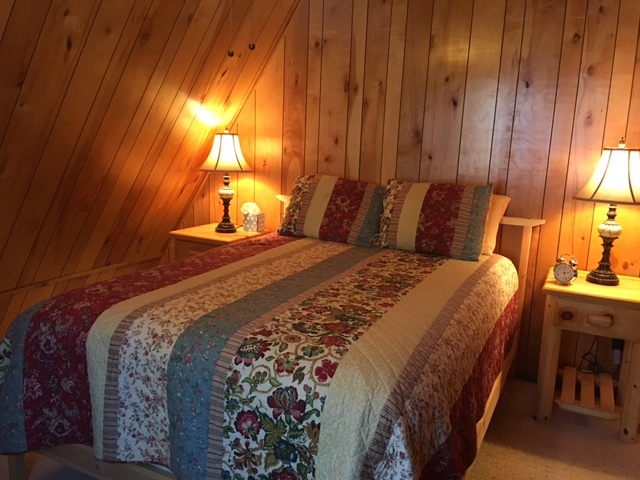 CLICK HERE to inquire about the availability of specific dates at Cozy Country Cabin 107. If you include full details — your name, phone numbers, an accurate email address, and your preferred dates — we’ll do our best to reply within 24-48 hours.